Even though I had the afternoon resting yesterday, my legs still seemed to be aching. This is the one of the first times my legs have been feeling properly heavy. Up to now, it’s always just been general tiredness, maybe all the miles are having their effect. Luckily today, even though I had planed a fairly long ride, was almost all downhill. 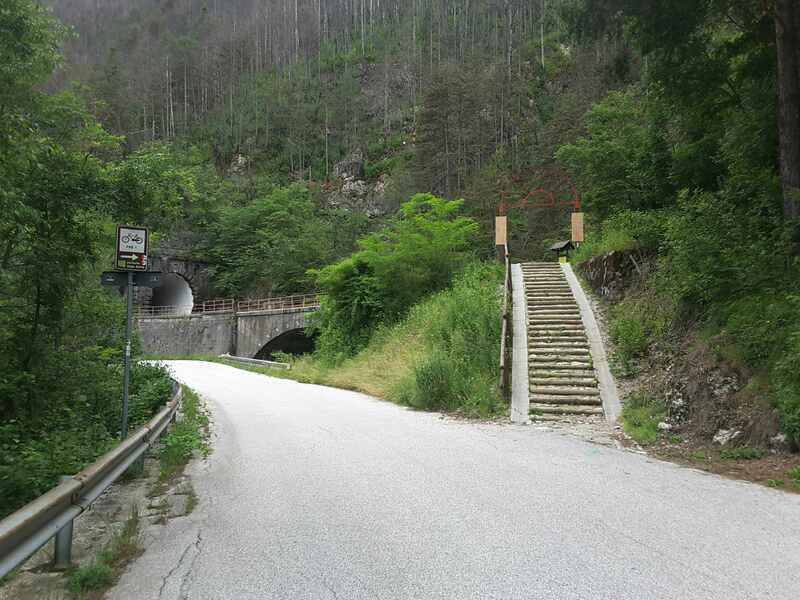 The elevation profile looked great, a gentle slope, down all the way into Italy. My last few km in austria, I'll visit you again soon! When I was in Scandinavia I thought, ‘wow, this is my favourite place’ and it is easy to say that about every country I visit. However, I really think Austria has been the best! I love the mountains, the food, the people and landscapes. It seems to be a very all round country having everything. Well almost, it doesn’t have any beaches or sea! Saying this, apparently some of the rivers have waves, so a type of surfing is possible! It was a Sunday which meant closed shops and lots of people everywhere. For the time being, I was still carrying on the Euro Velo route. Although it can be slightly annoying having to overtake people constantly, it’s good to see them out and about, keeping active. The Italian border was only around 30km away so I reached it just in time to stop for a snack in the new country. The smell of pizza, pasta and wine was lingered around the border! Iforget all the many, many German words I’d learnt (!) and had to start from scratch with a whole new language. The border was barely noticeable. Had it not been for the small ‘Italy’ sign I would have never had realised. No fence, no police and no border control. I had imagined Italy to be hot and very sunny. Today? Dark clouds with threatening rain approaching. This did not stop people venturing out though, there was even some kind of race on, either running or cycling. Although it hadn’t started yet, there were lots of feed stations with water and energy food and gels. Tempting as it was, if felt it would be too naughty if I helped myself to them! The weather was getting worse and it was now raining again. This isn’t what I came for! The signed route wasn’t great either. I lost the signs, doing a large circle of a small cobbled town. It was an hour before I got back on the route again. Serves me right for only following the signs and not checking the maps! Oh Italy, where's the sun gone? So far Italy wasn’t much different from Austria, but I was only 40km in, and being Sunday the shops were shut so I hadn’t had a proper conversation with any locals yet. What cycle path makes you wheel your bike up some steeps? Some Germans I had met in Nuremburg had warned me that Italians will try their best not to speak a word of english. However arriving at the campsite, the owner was more than happy to give their rusty english a go. I could almost smell the pizza wafting up from the restaurant by the reception. I thought it would be very rude to eat anything else apart from pizza on my first night in Italy, so ordered a €5 margarita. I can safely say pizza in Italy tastes the best! Welcome to Italy! If you have the time I’d recommend cycling all the way down along Fvg1 to Aquileia & Grado! Sorry about the weather… This bit of Italy was and still is more similar to Austria than to the “typical” Italian peninsula? Hey thank you for the welcome! I think I’ve started getting the ‘typical’ Italian weather today! 32°c, my water bottles are getting a lot of use!